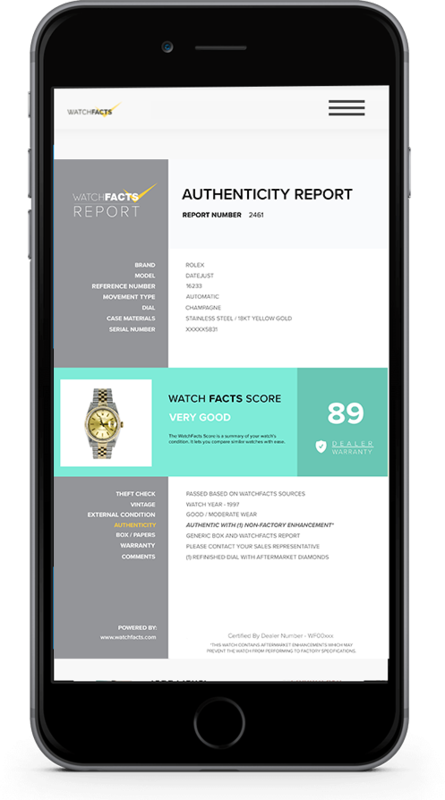 The WatchFacts Score is a tool that enables you to quickly understand the overall condition of a luxury item. It is a comparison that could save you a lot of money in the long run and lower the risk of buying an item with undetected problems. In the world of luxury items, it's hard to know what's real and what is authentic. Every WatchFacts Certified Dealer checks for authenticity, so you know what you're buying. Every single timepiece undergoes a rigorous 31-point inspection by the seller which checks and docuements: water resistance, external wear and functionality. 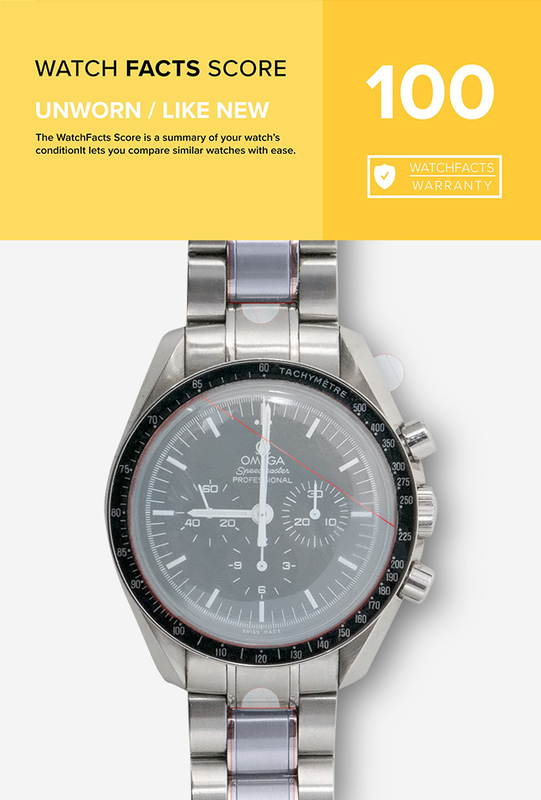 WatchFacts delivers peace of mind by backing every certified timepiece with a 1 year warranty covering functionality. This condition applies to a watch that has never been worn. All of the original factory boxes, papers, links, tags, and documentation should be included. Dial is new and flawless. Crystal has no scratches. There should be no alterations from the factory delivered condition and any protective factory plastic film should be in place. What you can expect is a watch in this condition will show little to no evidence of use that is visible to the naked eye. Factory stickers may have been removed. The case should exhibit no dents or dings and the bracelet should show little, if any evidence, of wear. The watch is working perfectly, keeping time according to manufacturers specification and needs no mechanical service. May be missing box and papers, links and other accessories. What you can expect is a watch in this condition will show scratches that are subtle, light and minimal. The case should exhibit no dents or dings and the bracelet should show little wear or stretch. The watch is working perfectly, keeping time according to manufacturers specification and needs no mechanical service. May be missing box and papers, links and other accessories. Normal wear by a careful owner who probably wore the watch regularly. Some scratches are evident, but no significant nicks or dings. Dial shows limited aging / wear and all dial pieces are intact. In some instances, the dial may have been redialed. The watch presents well, but may be missing a few accessories such as a link, box, or papers. The watch is working very well, keeping time according to manufacturers specification and needs no mechanical service. Refer to the Comments section and Seller notes in the Certification Report for more details. 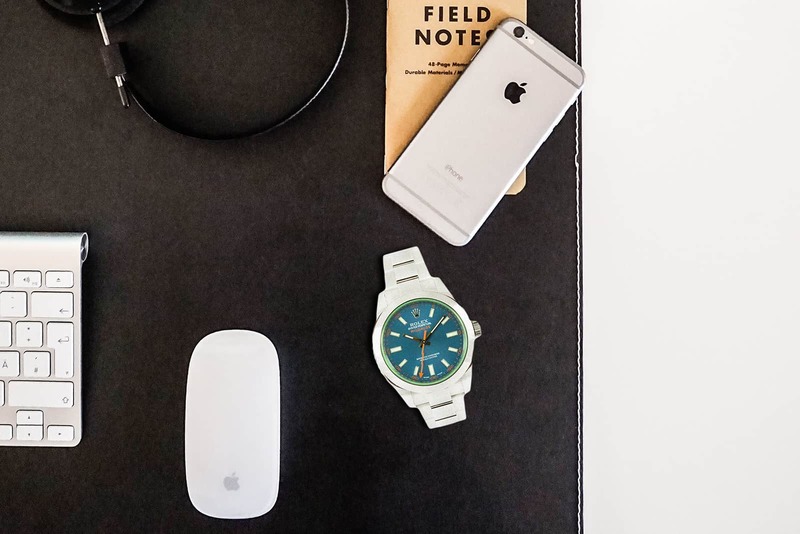 What you can expect is a watch in this condition will show a watch with no fundamentally incorrect features, but one that has obviously been enjoyed extensively. Dial may need refinishing. May have no more than one loose marker. The case will show dings, nicks, or deep scratches. The watch may be missing a few accessories such as a link, box, and papers. The watch is running and wearable, but may gain or lose a few minutes over a twenty-four hour period and service may be required. 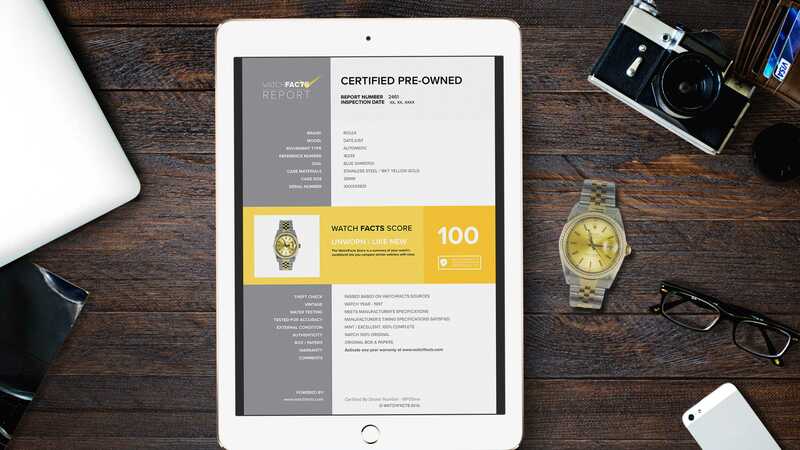 Refer to the Comments section and Seller notes in the Certification Report for more details. This condition applies to a watch that is well used and may require service or restoration to be wearable. The movement may be running erratically. The dial, case, and other major components may not be original. The watch may be missing a few accessories such as a link, box, and papers. 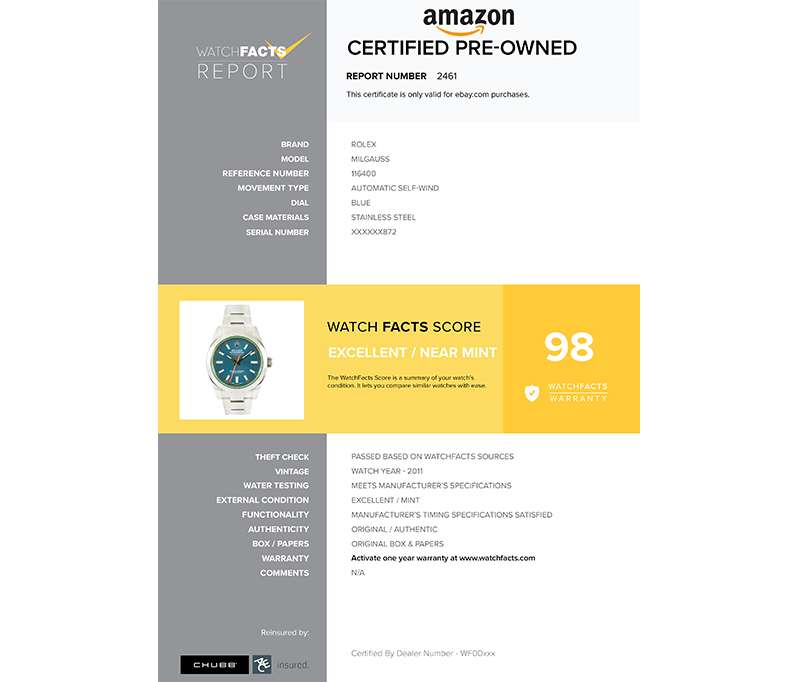 Refer to the Comments section and Seller notes in the Certification Report for more details. 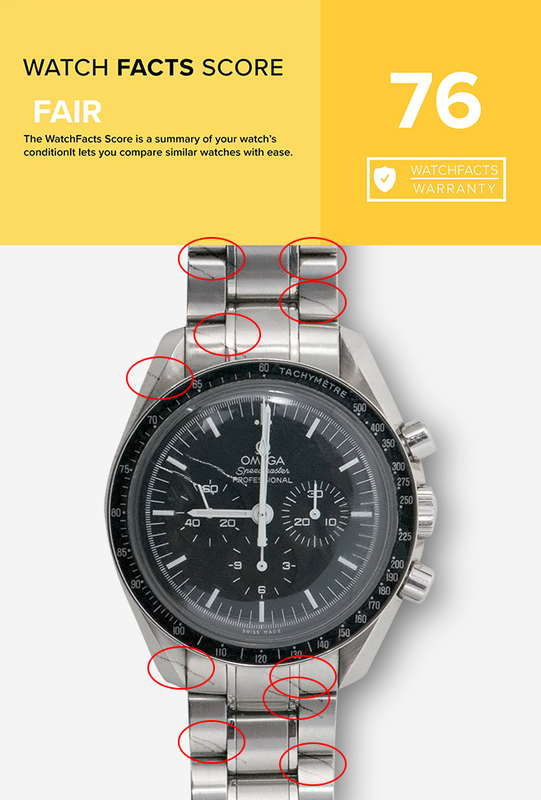 WatchFacts® Warranty does not cover items receiving these scores. Buy with confidence knowing each item goes through the same rigorous inspection process. Peace of mind and transparency via standardized reports. 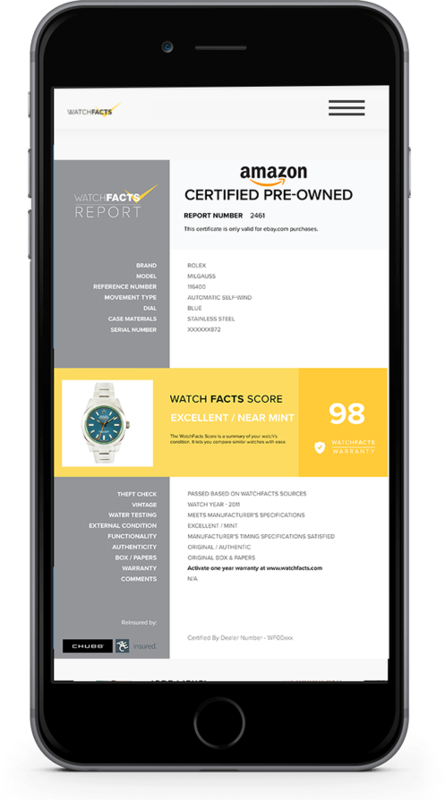 Our standard inspection report was created for consumers who want to buy from WatchFacts Certified Dealers. Warranty is not available on these reports. Certified Pre-Owned means you don't have to worry about performance or quality. Each watch has been inspected, tested and comes with a warranty backed by WatchFacts.